These cake/cookie bars are based on a recipe that I found in a children's book sometime ago in a chapter about heritage. The article was about a child of Mexican-Jewish heritage and the family's bakery called Los Bagels Bakery & Cafe in Arcata, California where they make Mexican-Jewish baked goods. It is a child-friendly recipe requiring minimal adult supervision. You can use a single type or a mixture such as regular, milk or butterscotch flavored chocolate chips and also a single type or a combination of nuts. I like to add oats or multi grain flakes often to baked goods (in addition to or instead of nuts) to enrich them and add a bit of texture and fiber too; and since they have oats, I think they make a wonderful breakfast treat with some fresh fruit and a glass of milk or hot coffee :). These bars are rich and delicious and disappear quickly! Great for times when nothing but a little chocolate will satisfy that sweet tooth :0. Cream the brown sugar and eggs. Combine flour, baking powder, and salt and stir into the creamed sugar-butter mixture. Fold in the 1/2 cup oat/multi grain flakes, the chocolate chips and nuts. Pour into a greased 9 by 13 inch baking pan and sprinkle the top with the 2 Tbsp oat/multi grain flakes and the saved nuts. Bake for 45 to 50 minutes at 350 degrees F.
Here is a very simple and quick as a wink Guacamole or Avocado salad. Perfect avocados don't need a lot of embellishments - just a squeeze of lime and a sprinkle of salt and freshly ground pepper are all it needs. Cut the avocado in half, remove the pit, and keep aside. Score the flesh of the avocado without cutting through the skin all the way. Scoop the flesh from avocado using a spoon into a bowl and discard the skins. Add the other ingredients and lime or lemon juice. Mash lightly with a fork and mix well. Place the pit into the salad and cover with plastic wrap to prevent browning which results from oxidation due to exposure to air. Serve right away with warm corn tortillas, tortilla chips, raw vegetables, quesadillas, Mexican beans, etc. or spoon into hollowed small or cherry tomatoes for quick and wonderful appetizers. Enjoy!! If you have never tried bitter melon before, it might take time to develop a taste for it. According to my sister, bitter melon (Parikkai in Tamil) Fry is the perfect side dish for Ripe Mango Pulisseri; the bitter tang of parikkai perfectly balances the sweet-and-sour of the pulisseri. Bitter Melons (Momordica charantia) are considered very healthful vegetables according to Indian lore of ancient medicine known as Ayur Veda. Eating them or even drinking their juice regularly is considered a good practice for cleansing the blood and controlling blood sugars as well as blood pressure. They are eaten as a vegetable and also used medicinally in China, Vietnam, and other Asian countries. There are two main types of bitter melon; smoother Chinese type and the very bumpy Indian. Choose firm, green, medium sized veggies when buying either type of bitter melon; yellowing ones are old and soft. Test the seeds with your fingernails; if they are not soft and tender, I remove them. Some like to leave the seeds in for the crunch even when they are not soft; see how you like it by leaving a few in if you wish. Food processors are wonderfully helpful in slicing evenly and quickly; if you have one do use it to slice bitter melon. The trick to reducing kitchen clutter is to quickly wash gadgets (i.e., the food processor) as soon as you are finished with them and put them away so that you are not faced with a mountain of things to wash later. I bake the parikkai/bitter melon slices in the oven to shorten the stove-top cooking time; baking also frees me to oversee other goings on in the kitchen. Once the slices are baked, it takes just a few minutes to quickly season them. Oil a large baking sheet and spread the veggies in an even layer; sprinkle with salt and drizzle with a Tbsp of oil. Bake in a 400 degree F oven stirring 2 or 3 times for about 20 minutes or until lightly browned. Let cool. Wash and dry the green chilies. Slit the ends or slice them in half lengthwise for easy removal after cooking. Chilies are added to impart flavor; they are not generally eaten unless one is particularly fond of eating hot chilies. If a hot dish is preferred, the chilies can be finely chopped before adding to the thalippu. Heat the oil for thalippu in a large skillet or wok; add chana dal and the mustard seeds. When the mustard seeds dance, add asafetida, green chilies and the baked bitter melon slices. Sprinkle the turmeric, sambar powder, and the aamchoor (or Lime juice) over all and stir well to coat. Cook until heated through and well mixed. Check for seasoning, add more salt or lime juice if needed and cook until salt is incorporated well. Serve hot with hot rice or chapatis and any dal, sambar, or Ripe Mango Pulisseri. 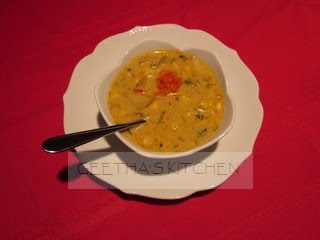 If you have yogurt sitting around with no place to go, make Mor Kootu/Curry, a classic South Indian dish. It is a thick stew traditionally made with spinach, heart of banana (vazhai thandu), or cucumbers and is named the particular vegetable mor kootu - for example, if it is made with spinach, it is spinach mor kootu. Other good choices of vegetables are: green cabbage, any type of summer squash like zucchini, (or gourds like tori and lauki) cauliflower and green beans. Try a single veggie or a combination or even none; as you wish. Frozen grated coconut is available in Indian or Mexican markets. I had one each of golden and green zucchini, and a one lonely Persian cucumber - all combined to make today's Mor Kootu/Curry; delicious! Wash well the zucchinis and cucumbers. Peel the cucumber. Cut off the ends and chop all the veggies into small pieces about the size of a corn kernel or as you wish. Cook the vegetables in a 3 qt/liter pan with 1/2 cup water, the salt and turmeric until tender. While the veggies are cooking, place the coconut, cumin seeds, green chilies, rice and 1 cup of the yogurt into a blender container and grind into a smooth puree. Pour into the cooked veggies and continue cooking. Pour the remaining yogurt into the blender container, pulse a couple of times and pour into the cooking veggies. Once the yogurt is added, watch carefully so the curry does not boil. As soon as the curry foams and begins to just rise up, remove from the heat. Prepare thalippu: Heat the oil in a small pan, add the seeds and chili. When mustard pops, add the curry leaves quickly and carefully and cover to avoid hot oil splashing. Pour the whole thing into the curry, cover, and let sit for 5 to 10 minutes. Serve hot, warm or at room temperature over rice, with dosa, upma, chapatis, etc. Roasted yellow corn and potato chunks in a buttery, golden, cilantro-scented broth with bits of red and green makes a very pretty presentation. It is a perfect soup for a large group as the recipe can be doubled, tripled, etc. and the roasting of all the vegetables eliminates the constant stirring and watching of the pot. Last December I made it for about 150 people and the soup came out very well. I usually make a double batch so everyone can have plenty and still have some leftover for another meal since the soup tastes even better the next day! You don't have to wait for fresh corn season to make this soup as the frozen corn kernels work just fine and saves time with prep work too! If you are lactose intolerant or a vegan, substitute oil and any non-dairy milk for the butter and cream respectively; you may wish to reduce the amount of water a little too (by about 1 cup) and increase the amount of the non-dairy milk so the soup is rich-tasting. Try this corn chowder recipe which is gluten and dairy-free! If using fresh corn, cut the kernels from the cob. Then carefully scrape against the cob with the blunt side of the knife to extract the milky juices. Set aside separately. Wash the potatoes well and drain; it is not necessary to peel. Cut the potatoes into bite sized chunks. Toss together the corn kernels (fresh or frozen), 2 or 3 thyme sprigs, onions, bell peppers, and the potatoes with 1/2 tsp coarse salt and a Tbsp of the unsalted butter and roast in a buttered or oiled baking pan until lightly browned, about 30 minutes at 400 degrees F. Stir the veggies 2 or 3 times during roasting to cook evenly. Heat butter in a 4 or 5 quart Dutch Oven or a large pot. Stir in the flour and cook until lightly browned and fragrant. Stir in 2 cups of the water slowly while whisking so that lumps do not form. Stir in turmeric, cumin, cayenne, and half the roasted corn - potato mixture. Add 2 cups of the water and bring to a boil and simmer for 5 minutes; coarsely mash with a potato masher. Now add the rest of the potatoes and the roasted corn, remaining thyme sprigs and corn juices if using fresh corn. Use the remaining 1 cup of water to deglace (collect the baked on bits and juices) the roasting pan and add to the chowder. Bring to a boil again. Turn off the heat and let sit covered for 5 minutes. Stir in the cream and the cilantro. You may substitute parsley for the cilantro. Check the seasoning and add more salt or pepper as needed. Serve hot with a little parsley, green onions or chives sprinkled on top. Awesome served with warm corn muffins or quesadillas :)! Happy Mother's Day Everyone! I am collecting recipes that remind us of our mothers. I have posted the recipes for Aviyal and Molagushyam, two of Amma's favorites. Please feel free to send me yours. This recipe comes from my friend Ellen's mother Virginia Burke of the Mayflower ancestry. Mrs. Burke majored in Home Economics and her specialty was Baking. 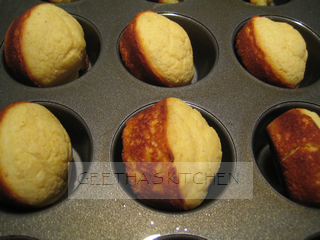 Ellen fondly remembers her mother serving these warm cornbread muffins with butter and honey as after-school treats. The only thing that is changed from the original recipe is that we have substituted butter for drippings and I also leave out the egg and instead use 1 Tbsp cornstarch dissolved in 1/4 cup of water or 1 Tbsp ground Flax seeds and water. Serve these muffins or bread with roasted corn chowder, mung dal soup, or your favorite soups. Preheat the oven to 425 degrees F. Spray or oil the muffin tin or a large cast iron skillet. Sift together first 6 ingredients into mixing bowl. Combine the next 3 ingredients (egg or substitute, buttermilk, and melted butter) and quickly add to the dry ingredients, stirring just to mix. Put the batter equally into a muffin tin or the iron skillet. Bake at 425 degrees F for 20 to 25 minutes. Check after 20 minutes to see if the muffins/bread are cooked; do not overcook. Serve hot with butter and honey. Enjoy! Spaghetti with Pistachio Pesto is a great dish for serving hot or cold. The shreds of zucchini just magically disappear while providing great texture and taste plus added nutrients. All you need to complete the meal is some fresh crusty bread and a crisp salad. 8 Main Dish Servings Each serving as prepared below contains about: 370 Calories; 12 g Protein; 49 g Carbohydrates; 14 g Fat; and 8.5 g Fiber. While the water is heating for spaghetti, prepare the pesto and the vegetables. Mix the grated zucchini and pesto together. Stir in roasted pepper, the green beans, salt, pepper and the Parmesan cheese. I like to break the spaghetti in 3rds so they are manageable to eat. Stir the spaghetti into the boiling water; bring to a boil again and turn off heat and cover. Let them sit undisturbed for about 8 minutes; test to see that they are cooked al dente - tender yet firm to the bite. Drain well and stir into the vegetable-pesto mixture. Mix well and serve immediately or chill until ready to serve. Serve hot, cold, or at room temperature garnished with the whole or chopped pistachio nuts sprinkled on top and additional freshly ground black pepper. I use Italian or flat leaf parsley for all the recipes as it is more flavorful. I make this pesto or the Cilantro Pesto weekly to keep on hand for pasta, sandwiches, dressing, etc. This recipe makes a sufficient quantity for 1 lb dry pasta, a week's worth of sandwiches and dressings. Spread a bit of the pesto on the bread slices before filling and grilling to make grilled cheese sandwiches extra special and serve with tomato soup. Or spread a pita bread or pizza base with the pesto and sprinkle with mozzarella cheese and bake until cheese is bubbly to serve with corn chowder. Either way, Yummy! Note: You can omit the pistachio nuts and/or the Parmesan cheese if preferred; the pesto is quite delicious without them. Wash the herbs (basil and parsley) well and towel dry or spin dry in a salad spinner. Strip off the leaves including the tender tips; discard the stems. Whack the garlic cloves with the flat side of the knife to crack them slightly; peel them. Place the herbs and garlic in the bowl of a food processor fitted with a metal blade and process until finely minced. Scrape down the sides as needed; add the salt and cheese if using. Pour 1/3 cup of the olive oil in a fine stream while the motor is running and process to a smooth puree. Pour in a bit more of the oil if pesto seems dry. Add the pistachios and whirl just to mix - I like it chunky. Scrape out into a jar and pour a little olive oil to cover the top - the oil keeps the pesto from darkening. Keep refrigerated and use as desired. Freeze for longer storage.